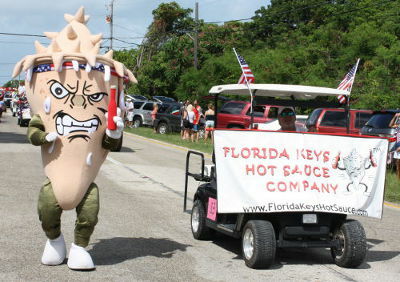 Typically the Key Largo 4th of July Parade is a peaceful fun-filled event for parents and children alike. 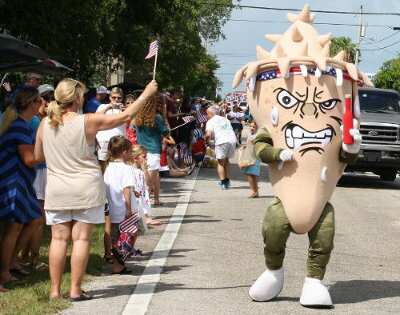 This Independence Day, things got a little hairy...The Crazy Conch watches with a wary eye as the crowd becomes boisterous. A man just made off with a bottle of hot sauce lifted from the Crazy Conch's stash. The Conch marches on as the man darts into the sidelines with his booty. A flag-wielding bystander gets a one-eyed stare - she'll know better than to mess with a steaming hot conch on such a day. Her two children look on in fearful disbelief, and they stop waving their flags just in time to avoid the attention of the Conch. The hot July sun is baking through his shell, and he has seen this type of crowd before. The smell of steamed conch tempts their senses, and the hot sauce bottle in his hand is just a dash away from turning the crowd into crazed shell-crackers to get at his meat! Seeing the frenzy about to develop, Captain Kevin, the Crazy Conch's right hand man, cuts hard left to turn around and administer crowd control. The cute decked-out golf cart does little justice to its dual nature as a getaway vehicle. 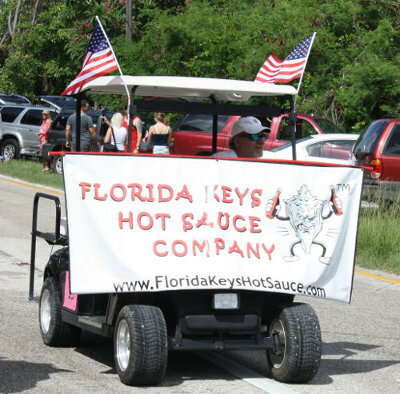 The Crazy Conch has been known to escape paparazzi and throngs of screaming women in this little monster hot-sauce-mobile! So Captain revs it up and heads straight to the source of the developing cracked-conch riot. If anyone can prevent a total hot-sauce meltdown, it's the clever Captain Kevin. Captain Kevin is careful to maintain an illusion of calm in spite of the growing unrest, and he eases up next to the Crazy Conch for a photo op. Meanwhile, talking under their breath so the hot & hungry crowd can't hear, they plan their unfolding getaway. 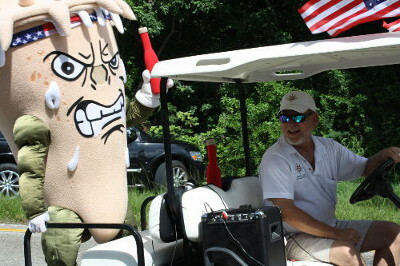 The Conch keeps one steamy eye on the crowd while Kevin unwraps the hot sauce gift set he had planned for the Parade master of ceremonies. There would be no opportunity for gift-giving now. It's life or death for the Crazy Conch. » Hurricane irma Aftermath ! !